1.) What size bus will I need? 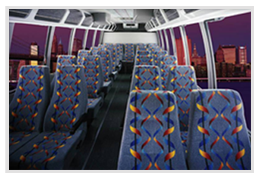 We can provide 47 and 55 passenger coaches. 2.) Where are you going? What will you be doing on your trip? Please think about a detailed itinerary. This will help us to provide a more accurate quote. If you need assistance, give us a call, we can offer some suggestions. Federal DOT regulations does not allow smoking on motorcoaches. Rest stops and meal stops can be provided to grant opportunities for smoking. 4). Is eating allowed on the buses? We strive to provide every customer with clean coaches. Please utilize the trash cans and trash bags provided on every trip. We have a $100 cleaning fee charged to any group that does not keep the coaches in a suitable manner. Please contact us to discuss a mutually agreeable arrangement. Prices and/or Quotes do need include the Driver's tip. Cancellations made 30 days prior to your departure date can result in a full or partial refund. This is a case by case basis. Cancellations made less than 30 days of your departure date will result in a loss of your deposit. Of course, emergencies and/or situations beyond your control will be considered. Deposits made can be applied to future bookings within 30 days. Deposits are required to secure your departure date. Deposits are normally 10% of the cost of the trip. We also can make special arrangements if needed.